If there’s a more interesting name for a vehicle I can’t think of it right now, can you? This is a 1967 Sunbeam Funwagon and as you can see it’s without the fun part, as in the camper on the back is missing. People, if I’ve asked you once I’ve asked you a thousand times, lock your vehicles, they’ll take anything these days! This future hauler project can be found here on Craigslist in Pasadena, Texas. 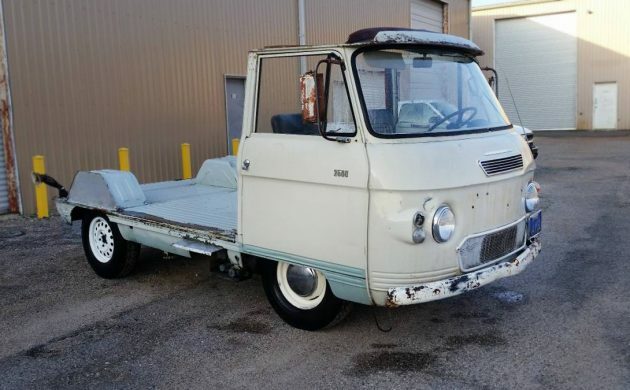 The seller is asking a mere $1,400 for what could be the coolest and most interesting project vehicle that I’ve seen in quite a while. Thanks to Roger for submitting this tip! Dang, my mind is going a hundred miles an hour, much faster than this Sunbeam could ever go, thinking of how I would use this cool cabover. Most of my thoughts come back to hauling a few oddball scooters and minibikes to shows. It almost looks like one of the Subaru or Honda or other mini-trucks that we’ve seen recently, the ones with the bed sides that fold down. 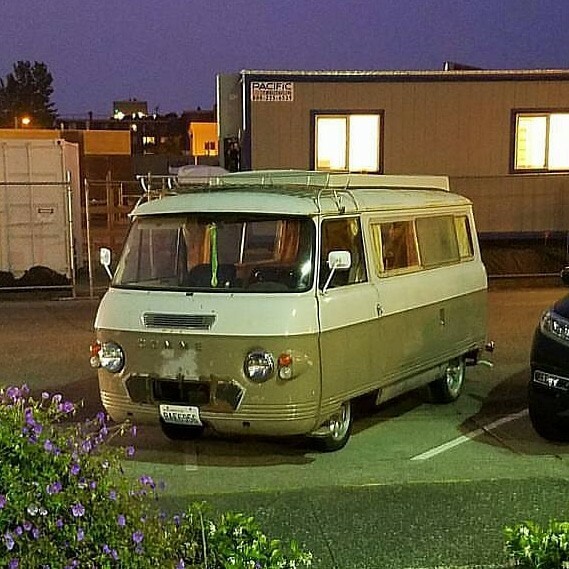 That’s probably what I would do here, create a knockoff of a Corvair Rampside of some sort with a built-in ramp for pushing motorcycles up onto the bed. What would you do? Hmm.. or would I have the ramp in the back. Decisions, decisions. 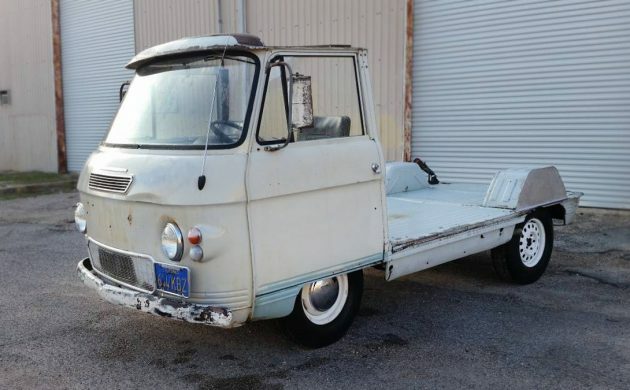 The Funwagon would have looked like this example that Josh wrote about here on Barn Finds almost three years ago. That was was all over the internet back in early-2016 and I bet that it was quite a sight in Iowa. 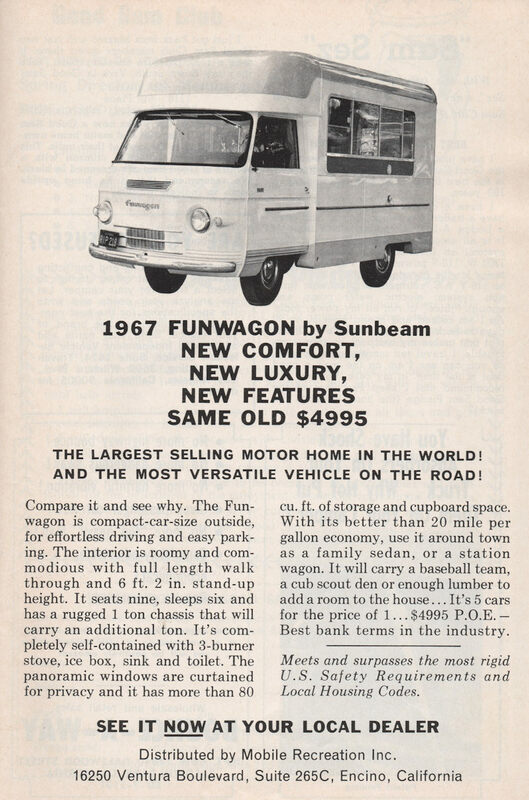 I love the official-looking line on this old advertisement piece: “Meets and surpasses the most rigid U.S. Safety Requirements and Local Housing Codes.” I’m taking a wild guess that this Commer FC (forward control) Van wouldn’t even come close to meeting either of those requirements today. 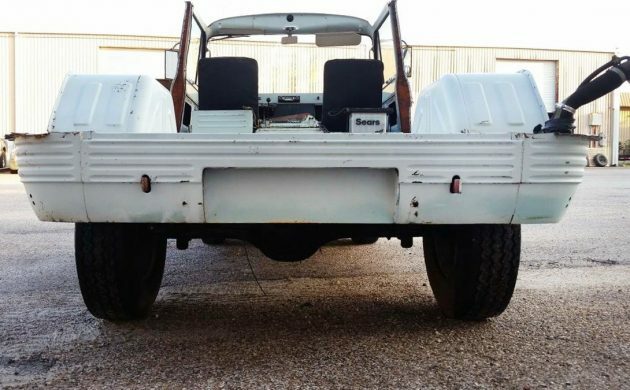 There are no engine photos and the seller says that “this vehicle is complete but does not run at the moment it was a camper I bought to make single cab pickup truck out of”. If a person wasn’t too concerned about traveling at high speeds or getting to those speeds quickly, fixing the current engine would be a good option. Although, as long as a custom hauler is in the cards anyway, why not just go for it and add a little more power? How would you use this former camper? I’d put an inline six in it say for example a gm 292 CID with 4 speed manual gear box. Then I’d build back a new camper body of my own liking a little wider with a set of dual wheels on the back. It should not have been torn apart but now that it is an up grade won’t hurt. Find a totaled Airstream trailer…stretch the frame, add a third axle…viola, frankenstein RV. Sorry, guys; I’m just not seeing the fun with this thing. With imagination and a bank full of cash send it off to Kindigit Design and they would make an amazing hot rod out of it. I have another one just like it (former camper). Bed is full of extra doors, seats, various parts. Also spare front axle. Mine could be available to whoever buys this one if desired. Where are you and what parts do you need? I am in southern NM. It was known as the Commer Highwayman in Great Britain! I hope he saved some of the Camper components. The fiberglass roof cap over the cab especially! Left hand drive; perfect USA project. These were slow back in the day, I used to PDI them when new, the engine is the same as a Hillman minx, Sunbeam Rapier, Sunbeam alpine etc, 1500cc I seem to remember but we fitted a 1725cc with overdrive from an Alpine or rapier into my fathers minibus in the 70’s, also the front track is a lot narrower than the rear……. but very well preserved, I don’t suppose there are more than a handfull left over here…. I remember replacing the entire rear chassis on one in the 70’s….. 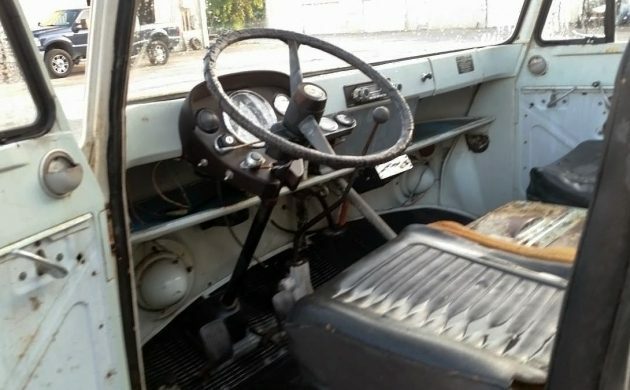 It would have had essentially the same drivetrain as the Hillman and Sunbeam cars, including the Alpine, so the largest stock engine would be the 1700+ cc four with about 85 hp. Rather than go for bigger in both engine room and body, I’d shoot for lightweight structure and an emphasis on simpler camping: no built-in toilet or other plumbing, simple bunks with storage underneath and probably a teardrop-trailer’s kind of basic kitchen under a lift-up rear hatch, water to be added on-site. You might assume that I’ve been thinking about this stuff for a while. You would be right … and if this were in Pasadena CALIFORNIA I would be there instead of writing about it! 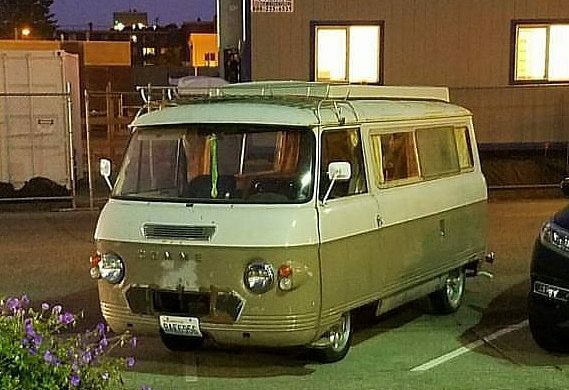 I have a road worthy commer campervan in washington state i drive all the time. (nfs) Always looking for commer parts and connections in the USA.